(PMCA — June 28, 2016 – Bethlehem, PA) — During the PMCA Annual Meeting of Members held Tuesday, April 12, 2016 at the Lancaster County Convention Center, Judy Cooley, Global Confection Connections and Philippe Levresse, Roquette America were ratified as the newest members of PMCA’s Board of Directors beginning July 1, 2016. 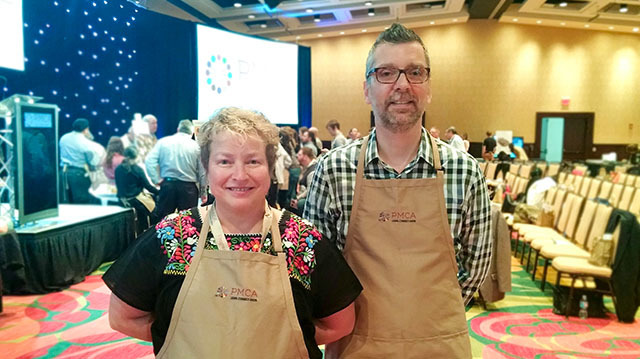 Rose Potts, Blommer Chocolate Company was elected to serve as the association’s new vice president. Outgoing vice president Edmund Wilson, Confectionery Consultant will transition to the role of president, with Robert Huzinec, The Hershey Company and outgoing president moving into the role of chair of the board. Mr. Huzinec replaces outgoing Chair of the Board Marlene Stauffer, Blommer Chocolate Company. Edward Minson, Natural American Foods will remain as treasurer of the association. New Director Judy Cooley is a product development candy technologist with a mission to combine passions for confectionery industry success with eradicating global malnutrition. She has expertise in global products, technical service, production feasibility & efficiencies, education and team-building. Judy has nearly 40 years of success in R&D and product implementation as a result of her employment history which includes 29 years at The Hershey Company. Prior to that she held positions at Leaf, Inc., Brady Enterprises, Schrafft Candies, School House Candies, A.E. Staley Company and Paul F. Beich Company. Judy is the recipient of multiple confectionery industry awards, serves on several industry association committees and boards, and has mentored many young professionals with an understanding and love of many cultures. She is an advocate of education, research and cooperation within the confectionery industry. New Director Philippe Levresse is a technical sales project manager for Roquette America. He started his carrier in 2000 as an applications specialist at Roquette America developing chewing gum, mint and sugar confectionery formulations. In 2008 he went on to lead the Food and Industrial Applications group at Roquette America in Geneva, IL and in 2010 he joined the technical sales team where he is currently responsible for technical support and new business development for the confectionery industry. He holds an engineering degree from Chimie ParisTech (Paris, France), a graduate degree from Université Pierre et Marie Curie (Paris, France) and a Ph.D. in macromolecular science and engineering from Case Western Reserve University (Cleveland, Ohio). He enjoys interacting with confectionery customers and being a part of this fun and friendly industry. He is an active member of the PMCA, serving on the Research Committee as well as on the On-Demand Content Sub-Committee. He is also a member of AACT and since 2014 he is serving as the treasurer of the Chicago section of the AACT. Incoming Vice President Rose Potts is the corporate manager of sensory and product guidance for the Blommer Chocolate Company where she has been employed for over 25 years. Ms. Potts has conducted chocolate training and taste seminars within the company as well for candy manufacturers at industry conventions including the American Association of Candy Technologists (AACT), the Philadelphia National Gift and Gourmet Show, the Retail Confectioners International (RCI), the Chocolate Manufacturer’s Association (CMA), the PMCA and the Biscuit & Cracker Manufacturer’s Association (BCMA). Ms. Potts is the recipient of PMCA’s 2010 Hans Dresel Memorial Award for service to the confectionery industry and has been serving on the PMCA production conference committee for several years.